This is my command base for the new Austrian WAS/SYW army I’ve started. Ulysses von Browne (October 23, 1705 – June 26, 1757), of Irish extraction, was already a colonel of an Austrian infantry regiment by the age of twenty nine. He gained much of his miltary experience during the Italian campaign of 1734 and he distinguished himself in the Tirolese fighting of 1735, and, in the Turkish war, he won further distinction as a general officer. 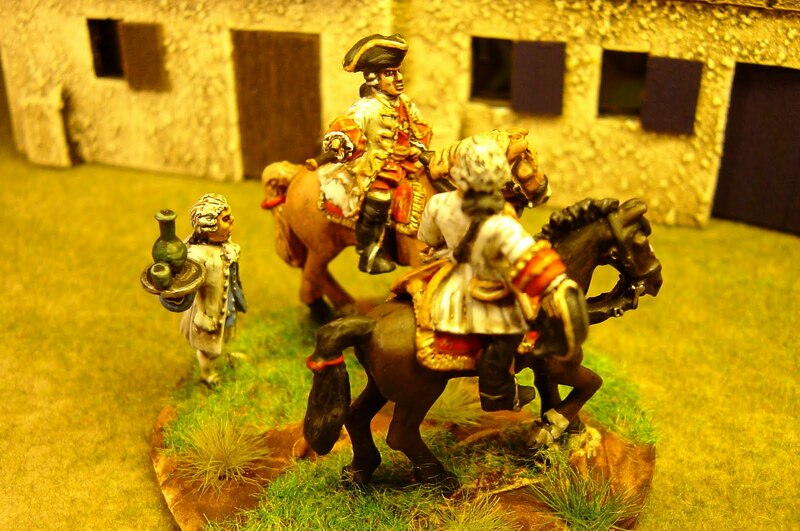 He was in Bohemia when the SYW opened with Frederick's invasion of Saxony in 1756. Von Browne's army, advancing to the relief of the Saxon army at Pirna, was met, and, after a hard struggle, defeated by the king at Lobositz, but he drew off in excellent order, and soon made another attempt with a picked force to reach Pirna, by wild mountain tracks. The field marshal never spared himself, bivouacking in the snow with his men, and Carlyle records that private soldiers made rough shelters over him as he slept. He actually reached the Elbe at Schandau, but as the Saxons were unable to break out, von Browne retired, having succeeded, however, in delaying the development of Frederick's operations for a whole campaign. In the campaign of 1757 he voluntarily served under Prince Charles of Lorraine, who was made commander-in-chief, and on the 6th of May in that year, while leading a bayonet charge at the battle of Prague, von Browne, like Schwerin on the same day, met his death. He was carried mortally wounded into Prague, and there died on the 26th of June. 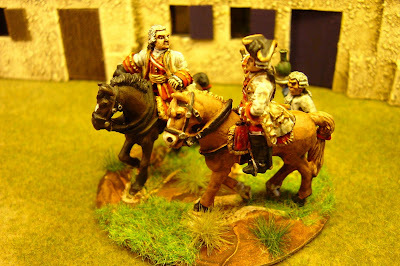 The mounted General figures are by Front Rank, one of the few companies that make decent Austrian figures of generals, but they are on Foundry horses. The flunky at the back, nonchalantly holding a tray with a bottle of Tokay on it, is by Foundry too. These gentlemen will soon be requiring a drink when they see the Prussian army. 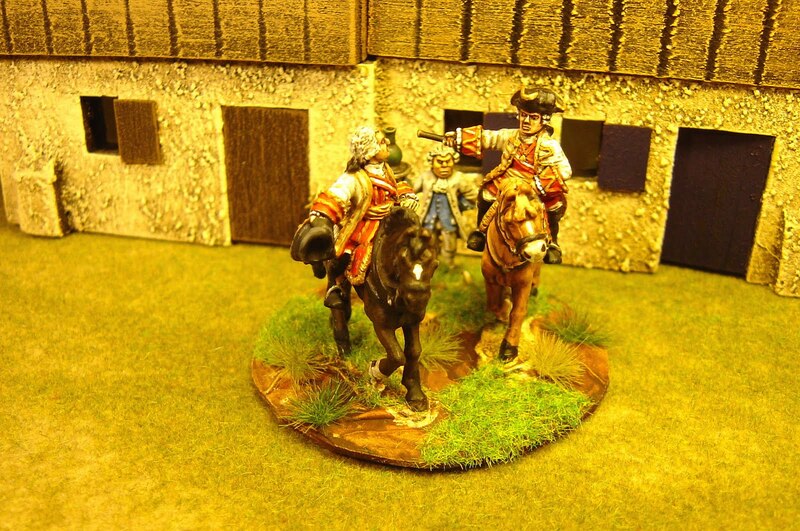 Lovely work Nigel - another great little vignette.